Blog Archive 2015 Jan .
Jersey Dresses are a very practical addition to your day wear wardrobe. 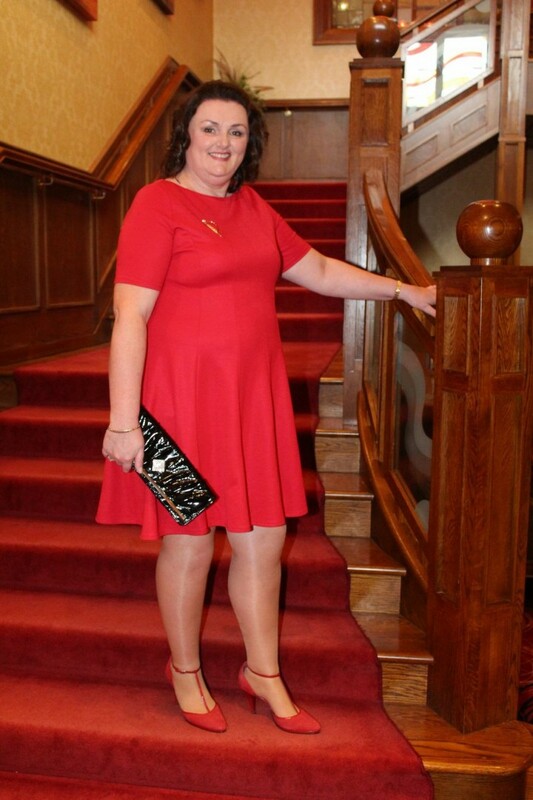 This little dress has many standard features that compliment various shapes of plus size woman (from the cut and fall of the material below the bust line (which helps hide a wide tummy ), the flattering V Neck Line (which minimises a spare chin and creates shape to a rounder shaped face) and the 3/4 length sleeves which help define a waist). Today I'm modelling the Gardenia Jersey Tea Dress from the New Season Collection Spring/Summer 2015 at Monsoon. It is a simple knee length day wear dress in a "Libertyesque" type print. I am 5' 9" tall and I am wearing size UK18. The dress is available to size UK22 and is priced at £59. There are two great features this dress offers. Firstly it is machine washable so is "easy care easy wear". Secondly it can be worn, as below, as a more formal day wear look with heels OR can be worn more casually and BoHo Chic with boots and a slouchy cardigan. Gardenia Jersey Dress from Monsoon worn as a casual day wear look. Above the waist the dress is lined but the skirt is NOT. In the pictures I am wearing a petticoat underneath for added warmth and to minimise static cling as I am wearing tights. Although this is New Season Spring/Summer '15 day wear from Monsoon, you can still wear this dress now with the addition of a thermal cami vest and either half slip or full length petticoat. The addition of the cardigan (for a more slouchy and relaxed look) will give you the much needed warmth until the real Spring arrives. This week I am reviewing one of the "Designers at Debenhams" . Star by Julien Macdonald is a mid-price collection of separates and dresses. Typically prices range from £25 - £65. I love the flexibility that mixing and matching separates gives you when varying your look. For Spring/Summer '15 the Star Collection offers lots of choice in light, bright, floaty and patterned looks. I find it disappointing that the sizing only goes up to a plus size UK20, because many of the shapes of tops (in particular) would look great on a curvier figure. I hope that pressure from the plus size community, asking for bigger sizes, will get the Star size range increased. There is just no escaping the neon bright influence and this wonderful lime pleat front top is perfect for wearing with trousers, skirts or smart bermuda style shorts. I love the chiffon style sleeves and the loose open neck fit. The body of this top is lined (but not the sleeves). I have paired this top with a pair of floral pattern scuba pants. It is hard to know exactly what to call the various cuts and styles of trousers now available on the market but suffice to say that these are definitely smarter than a legging and have the cut and fit of a pair of ankle grazer trousers. I am 5'9"tall and ordinarily a size UK18. I am however wearing these trousers in a size UK16. There is lots of "give" in the trouser material, so I do think that someone who's normally a size UK22 will get in comfortably to the size UK20 (the largest size available in the Star range). Please have a look at my video below to see and hear about the top and trousers in detail. Because of changes to my lecturing work, my blog postings will now be published on Fridays or Saturdays.